"An easy to make light salad that can be served with or without chicken for vegetarians." Bring the water, bouillon cubes, and garlic to a boil in a saucepan. Stir in the quinoa, reduce heat to medium-low, cover, and simmer until the quinoa is tender and the water has been absorbed, 15 to 20 minutes. 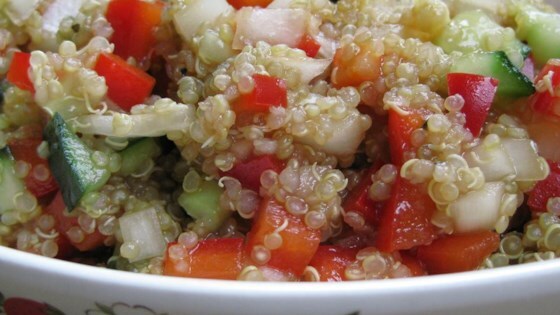 Discard the garlic clove and scrape the quinoa into a large bowl. Gently stir the chicken, onion, bell pepper, olives, feta cheese, parsley, chives, and salt into the quinoa. Drizzle with the lemon juice, balsamic vinegar, and olive oil. Stir until evenly mixed. Serve warm or refrigerate and serve cold. This was good but I thought the lemon flavor overpowered the other flavors in the salad. That being said, I will make this again because it's a good and healthy option for lunch. If you are reading this review, then do yourself a favor: enjoy this recipe ASAP.